Bulldogs InterchangeRobert Murphy off due to an injury. Bulldogs InterchangeMark Austin off due to an injury. The Lions are up and about and are perhaps clinging to the oh so brief finals chance that may present if Essendon's points are docked. GOAL LIONSRich handballs inside to Green who runs around and kicks another goal for the Lions. GOAL LIONSYeo runs through midfield and kicks to Merrett. He handballs to Raines who kicks through traffic for a goal. BEHIND BULLDOGSDahlhaus tries one from distance, but it bounces through for a behind. GOAL LIONSBrisbane have been paid the free kick with advantage played. Rich receives the handball and keeps going to snap it around the corner for a goal. Raines has the big job on Griffen. We are off and underway at the GABBA. 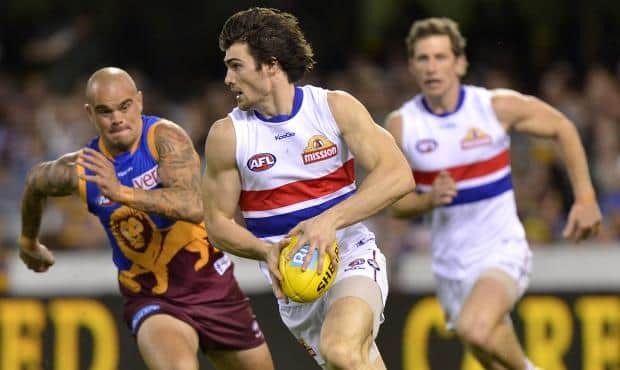 Round 22 concludes at the GABBA with the Brisbane Lions hosting the Western Bulldogs. One late change for the Bulldogs with Cooney replaced by Addison. The substitutes for both teams are Marco Paparone and Jason Tutt respectively. Welcome to Gabba for the Brisbane Lions v Western Bulldogs Round 22 clash. 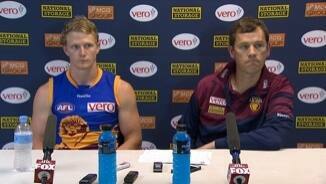 IT SEEMED like old times when the "Welcome Back Lethal" banner was unfurled in the Gabba stands on Sunday night. 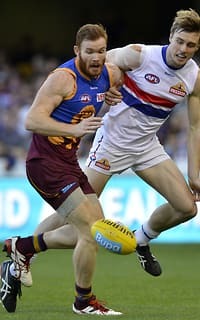 But the Brisbane Lions hardly looked like Matthews' premiership-winning teams of old, squandering a 57-point lead before holding on for a tense seven-point win over the resurgent Western Bulldogs, 15.10 (100) to 13.15 (93). A week after reeling from coach Michael Voss' shock departure, the Lions lined up on Sunday night with yet another major distraction hanging over their heads. Indeed, their final home match of the year had become something of an after-thought after ex-mentor Matthews jumped on a rival ticket hoping to topple Lions chairman Angus Johnson as the race for master coach Paul Roos heated up again. And a quick glance at the banner amongst the Gabba faithful on Sunday night would only have reminded the Lions players of the looming boardroom stoush. However, at first the Lions seemed oblivious as they romped to a 13.2 (80) to 4.6 (30) half-time lead. The Lions were flying high after Dayne Zorko's second consecutive running goal - and his side's fifth straight major - blew the deficit out to 57 points in the second term before settling for 50 by the main break. 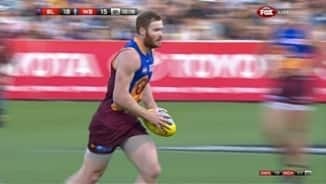 Remarkably, the Lions would only kick 2.8 for the rest of the game as the Bulldogs came roaring back. Interim coach Mark Harvey said it was character-building to win after staving off the comeback. "I think we learned a lot about our playing group," Harvey said. "They are discovering themselves. "It was a good effort to extend the lead like we did so early and then to have a team that has been up and running for the last six to eight weeks, we always knew they were going to challenge us at some stage. "You find out a lot about each other during that situation. It was a bit chaotic for a bit there but in the end they fought them off." At one stage, the visitors kicked eight out of nine goals to reduce the deficit to just 10 points in the final term. Lions tagger Andrew Raines appeared to boot a settling major for the hosts to blow the lead back out to 16. 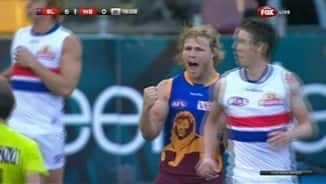 But the Bulldogs' Luke Dahlhaus made up for a point-blank shank by kicking truly for a major moments later before Daniel Giansiracusa received a dubious 50m penalty to make it a five-point game in the dying moments. Somehow the 20,130-strong Gabba faithful willed the Lions to the gripping win - their sixth straight home victory of the year. Bulldogs coach Brendan McCartney said he was proud of the second-half comeback, but critical of his team's first-half performance. "We got a first-hand look tonight and we got a nice reminder that when we don’t want to do the basics of the game and work hard and make it tough for the opposition to move the ball, it's a pretty difficult game to play," McCartney said. "To their (Lions') credit they were hungrier than us in the first half, they were harder around the contest than us in the first half and they worked harder. 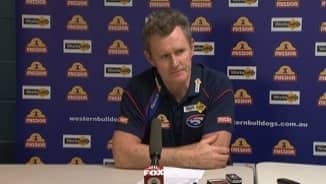 "We know the journey we're on, we just got a nice reminder tonight as a footy club how hard this business is and how much work's in front of us." Tom Rockliff (33 disposals) and Matthew Leuenberger (17 touches, 22 hitouts, two goals) were outstanding for the home side while Luke Dahlhaus (20 disposals, three goals) and Matthew Boyd (27 touches) were among the Dogs' best. The Lions' sixth win in eight games avenged their surprise 68-point opening round loss to the Bulldogs. The home side had won only five first quarters in 2013 - the equal-fewest of any side. However, the Lions jumped out of the blocks to lead 7.1 (43) to 2.5 (17) at the first break thanks to back-to-back goals to Daniel Merrett. 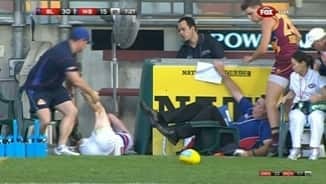 But the tide started turning after Merrett was carried off on a stretcher early in the third term with a suspected ankle complaint. Harvey said Merrett went straight to the hospital for scans but there was no immediate update post-match.